The below represents a selection of the newspapers, magazines, blogs and book features we have been published in over the past few years. 'Hare Trophy' featured in Bath Life Magazine. Published in March 2018. UK. 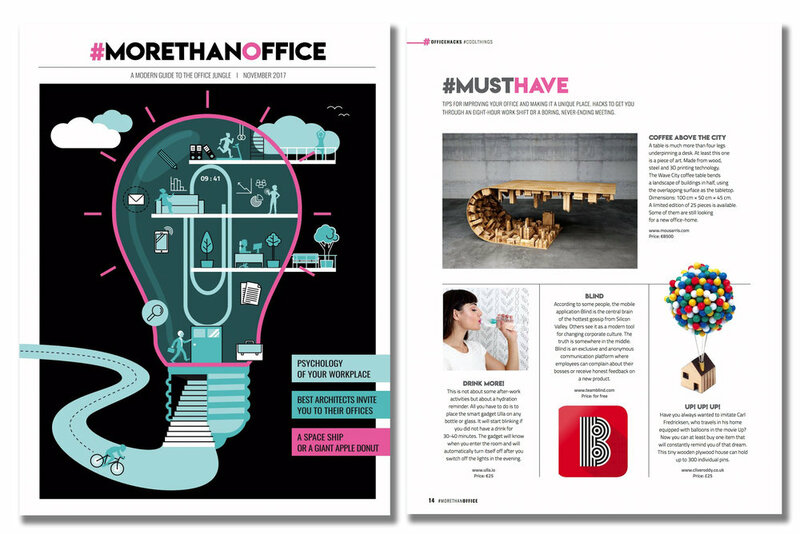 'Balloon Pin House' featured in #Morethanoffice Magazine. Published in November 2017. Czech Republic. 'Balloon Pin House' featured in 'O' - The Oprah Magazine. Published in December 2016. USA. 'Cacti Coasters' featured in GoodHomes Magazine. Published in August 2016. UK. 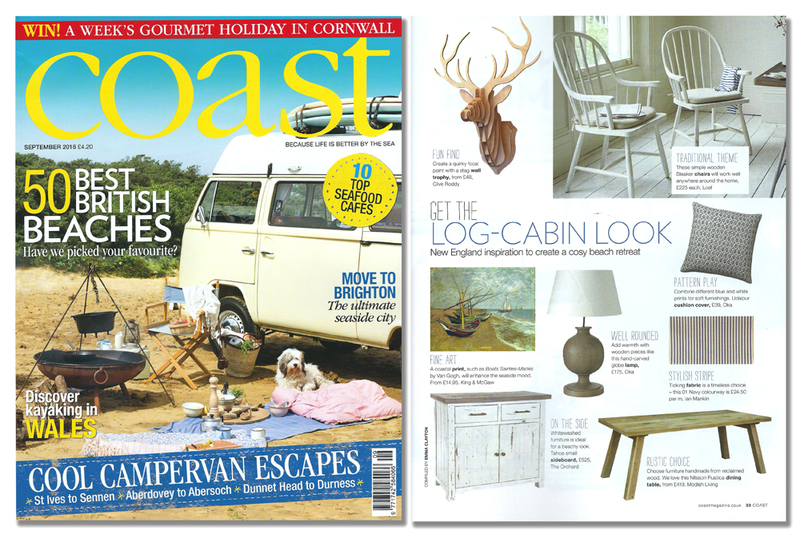 'Stag Head Trophy' featured in "Coast' magazine. Published in August 2016. UK. 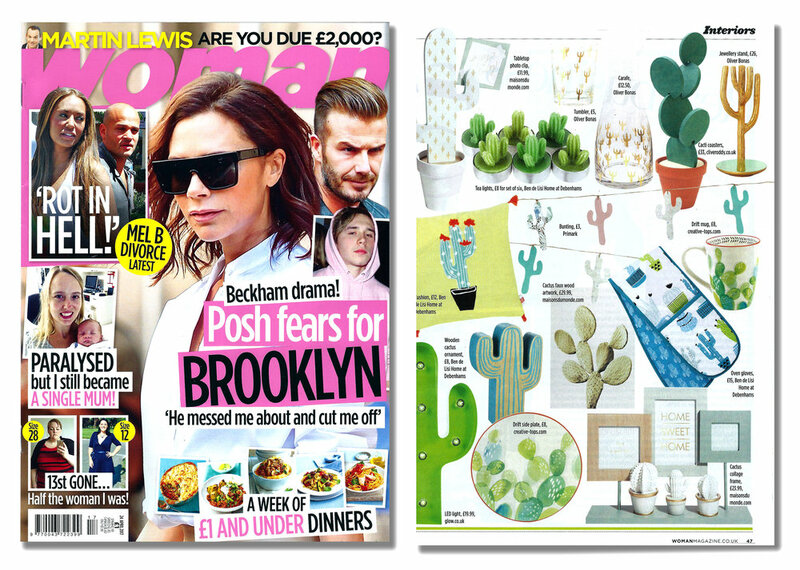 'Cacti Coasters' featured in 'Fabulous' - The Sun Newspaper Magazine. Published in May 2016. UK. 'Cacti Coasters' featured in 'T' - The New York Times style magazine. Published in February 2016. USA. 'Cacti Coasters' featured in Homemaker magazine. Published in April 2016. UK. 'Large Stag' featured in the Autumn/Winter 2015 edition of 'Notes -The One17 Magazine'. Published in November 2015. UK. 'Cacti Coasters' featured in New York Magazine's 2015 Gift Guide. Published in November 2015. USA. 'Wave Door Stop' featured in German magazine 'Places of spirit'. Published in August 2015. Germany. 'House Rings' featured in Inside Kent Magazine. Published in May 2015. 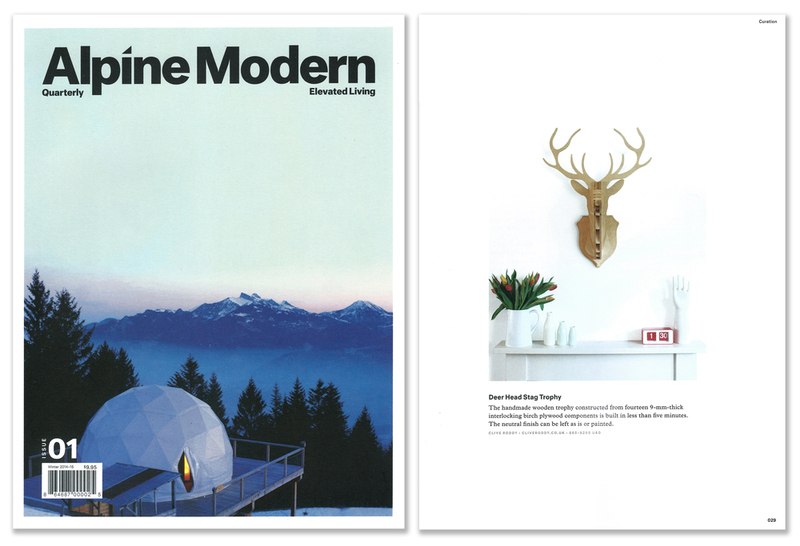 'Large Stag' featured in issue 01 of the quarterly publication 'Alpine Modern'. Published in 2014-15. USA. My work was recently featured in Eat & Travel Weekly. Published in May 2014. Hong Kong. 'Landscape Rings' featured in Company magazine. Published in December 2013. UK. 'Hare Trophy' featured in Homemaker magazine. Published in December 2013. UK. 'House Rings' featured in Sense Magazine. Published in May 2013. Taiwan. 'Stag Head Trophy' featured in the Stilwerk Booklet for Etsy. Published in December 2013. UK. 'Stag Head Trophy' featured in Business Life magazine. Published in February 2013. UK. 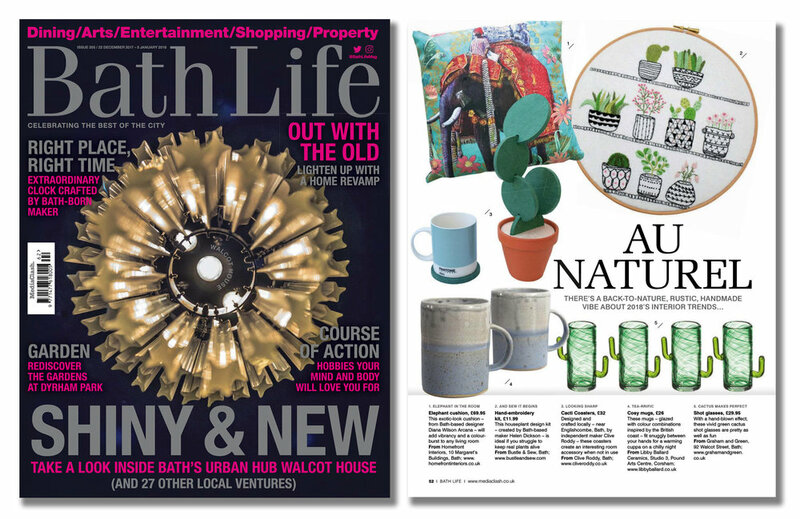 'Cacti Coasters' featured in Bath Life Magazine. Published in December 2017. UK. 'Balloon Pin House' featured in Frankie Magazine. Published in October 2017. Australia. 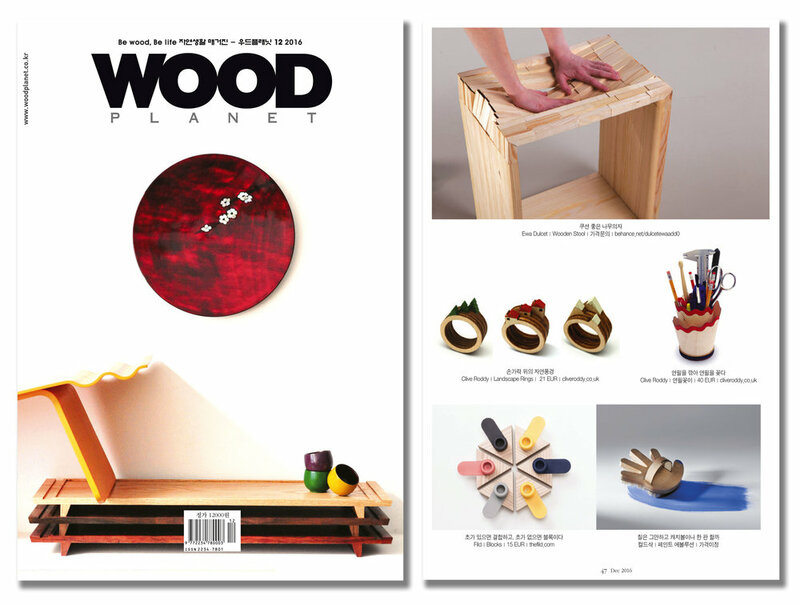 Work featured in Wood Planet Magazine. Published in December 2016. Korea. 'Hare Trophy' featured in the April edition of 'Country Living' magazine. Published in March 2016. UK. 'Cacti Coasters' featured in Woman Magazine. Published in April 2017. UK. 'Cacti Coasters' featured in Dutch publication 'AD Magazine'. Published in October 2015. Netherlands. 'Spoon Lamp' featured in design book 'Sustainable Living & Green Design''. Published in 2015. China. 'House Rings' featured in Austrian architecture magazine 'Holzbauaustria'. Published in January 2016. Germany. 'Landscape Rings' featured in Israeli newspaper Haaretz. Published in July 2015. Israel. 'Landscape Rings' book feature 'Make Me Smile''. Published in 2014-15. Spain. 'Spoon Lamp' featured in design book 'Art without waste'. Published in 2014. USA. 'Stag Head Trophy' featured in House & Garden Magazine. Published in August 2014. 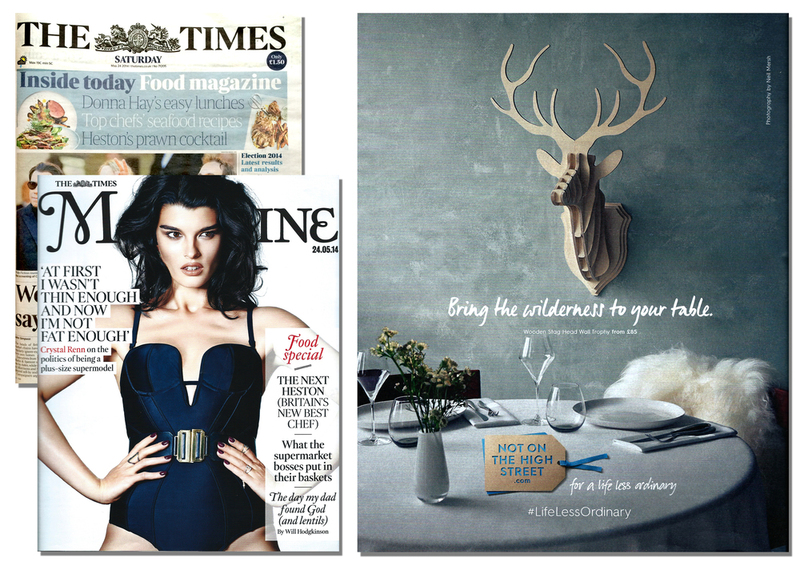 'Stag Head Trophy' featured in The Times newspaper magazine. Published in May 2014. UK. 'Spoon Lamp' featured in the Korean design book 'Objet2'. Published in 2013. Korea. 'Tree Rings' featured in Simple Things Magazine. Published in December 2013. UK. 'Hare Trophy' featured in the Metro newspaper. Published in March 2013. UK. 'Stag Head Trophy' featured in 91 Magazine. Published in December 2012. UK. Many of these features are also documented on our Facebook page here.